It’s all about energy—especially energy on a cellular level. Alpha-lipoic acid is a powerful antioxidant that plays a crucial role in creating energy in the cells. Coenzyme Q10 helps convert food energy into cellular energy. There is also a concentration of coenzyme Q10 in the heart and organs with high-energy demands. 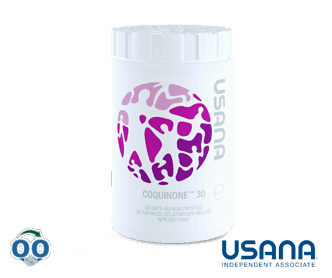 USANA combined alpha-lipoic acid with coenzyme Q10 to create CoQuinone 30, a fantastic supplement of these energy-supporting nutrients. The benefits associated with these nutrients include supporting normal cardiovascular health. As you age, your body naturally produces less coenzyme Q10. Fortunately, the proprietary CoQuinone 30 formula is clinically proven to deliver more CoQ10 to the blood stream than competing products. The average adult heart pumps 2,000 gallons of blood each day. As one of the hardest working organs in the body, the heart has unique nutritional needs. Nutritional deficiencies may even contribute to cardiovascular disease – the number one cause of death in the United States. Our Heart Health supplements are specially designed to support healthy heart function.